Did you buy or just happily living in your home last year? 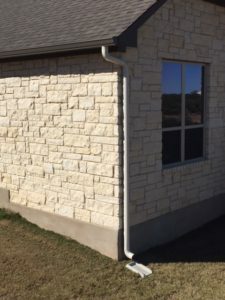 Does your home have gutters? Do you need gutters? Yes, every house needs a properly working gutter system. Homeowners often do not realize the importance of having a properly working gutter system on your home. Unfortunately, gutters are frequently overlooked by homeowners because they are simple low maintenance structures. Without gutters, water can become waterlogged and can cause damage to the structure of your home. Improper rainwater drainage causes soil erosion, brick staining, and rotting fascia, just to name a few. Gutters funnel gallons of water away from your home year round. Protect your investment. Protect you home. Contact us for a free estimate and for more information on our seamless gutter services.